Has God ever used something surprising to help you forgive someone? Recently the book Rising Strong jumped out at me from the library shelf. I was excited to read more from this talented author and researcher Dr. Brene Brown, who probes the topics of shame and authenticity with a fresh voice. In Rising Strong she tells a story about rooming with an obnoxious person at a conference. Dr. Brown couldn't wait to get back to her regular counseling appointment to feel validated in her judgment against her offender. Her therapist listened and then said, "Have you considered she may have been doing the best she could?" This question rocked Dr. Brown to the core. She had never considered that perhaps the offender wasn't being intentional in her obnoxiousness. That maybe she was under stress, and she handled it by lashing out. That perhaps she didn't care about being polite because she had been badly hurt. That maybe she hadn't learned basic respect from her parents. Or a million other unknown reasons. By holding onto her judgment that her offender was NOT doing her best (all things being considered), Dr. Brown was becoming the person she didn't want to be: condemning, harsh, and judgmental. She learned this important fact: the key to letting go of judgment is forgiveness. I put this book down and turned out the light before bed. Right then, my husband and I fell into our pattern of arguing about the same old things. If you've been married for a while, I'm sure you have similar patterns. After the argument, I was hurting. I was tempted to fall into my same, predictable thought patterns of self-righteousness and self-protection. The phrase flew through my mind: "Have you considered he may have been doing the best he could?" Maybe the argument wasn't about me and my hurts. Maybe it was about unseen hurts and frustrations that need healing. I sensed God telling me to forgive. To be quite honest, that's not usually what I do only minutes after the same old argument. The terrible fact is, those Roman soldiers were just doing their job as they nailed Jesus to the cross. They probably saw nothing wrong with it. Yes, they were sinning, no doubt about it. But they didn't really understand the seriousness of their sin. They didn't understand the role they were playing, or the shocking hurt they were causing. All things being considered, they were doing their "best." I am amazed that Jesus, the Son of God, didn't judge the men nailing him to the cross. He forgave them and gave them grace, even when he was suffering. We don't know whether those soldiers turned their lives around. We can assume they heard Jesus say those words, and perhaps it gave them pause after the other events of Jesus' death and resurrection unfolded. Maybe a day came when they prayed, "Father, forgive me, for I didn't know what I was doing." There's always hope when forgiveness is granted. A few days have passed since our argument. Usually I am still nursing my wounds at this point and I'm struggling to move past a low-lying cloud of sadness. But because God gave me valuable insight at just the right time through the book, I am doing much better than usual. My head is clearer and my heart is stronger. I'm able to move forward faster. Overall, I have greater peace because I forgave immediately after the offense. I thank God for speaking to me through that book. I thank him for teaching me new ways and giving me new hope. He will do the same for you, in whatever area you need to practice forgiveness, dear friend. 1. Which relationship in your life is most affected by unforgiveness? 2. Do you think that your offender may be doing the best they can, all things being considered? 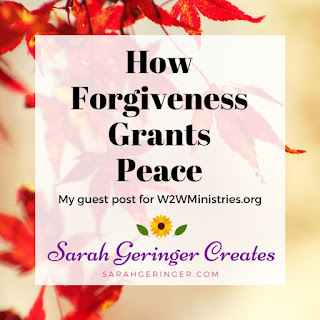 How can this help you grow in forgiveness? 3. How can Jesus' prayer help you the next time you are hurt by an offender? Every argument or conflict we face or judgment we are tempted to make about others needs to be bathed in this reality--people almost always are doing the best they can. I love how you also related it the soldiers who Jesus forgave, Sarah! That's the best insight of all! Thanks for inspiring us to be more like Christ! I'll be pinning! What important choices we make when others offend us--choices that either make our lives better or fill us with stress. I love the question Brene poses. I'll remember that the next time someone offends me.